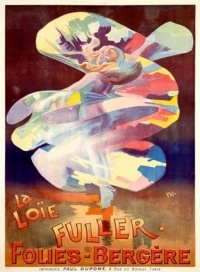 Loie Fuller (also Loïe Fuller, born Marie Louise Fuller) (January 15, 1862 – January 1, 1928) was a pioneer of both modern dance and theatrical lighting techniques. Unless indicated otherwise, the text in this article is either based on Wikipedia article "Loie Fuller" or another language Wikipedia page thereof used under the terms of the GNU Free Documentation License; or on original research by Jahsonic and friends. See Art and Popular Culture's copyright notice. This page was last modified 14:11, 1 May 2009.